As the gateway to the Mayan pyramids, Cancun really does have it all: postcard-perfect white sands, turquoise-tinted Caribbean waters, and plenty of places to dance salsa, eat tacos, and party around-the-clock. 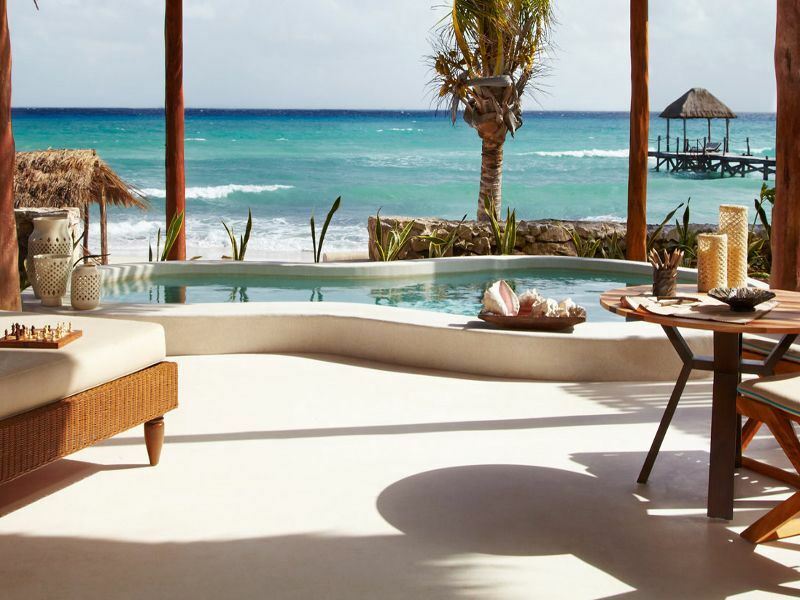 We check into 10 of the most luxurious hotels in and around this sunny Mexican playground on the north-east corner of the Yucatán Peninsula. 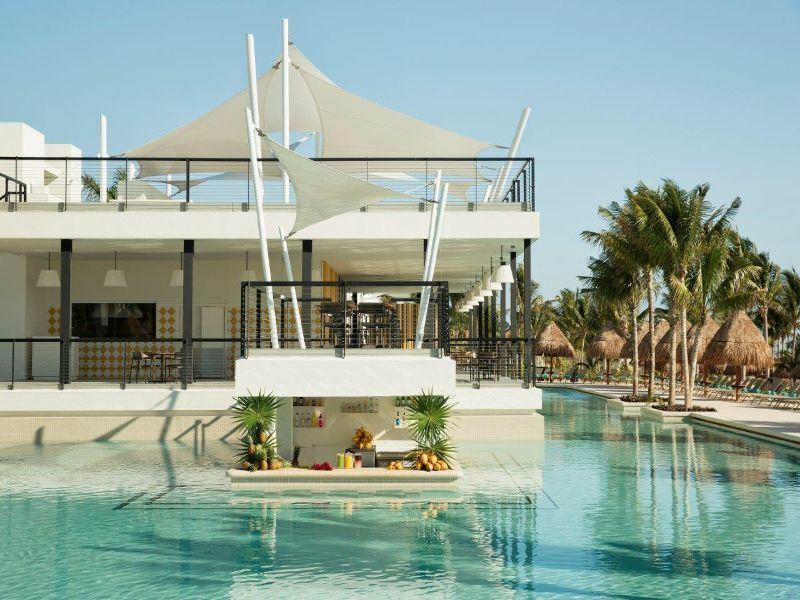 The scene: Swoon-worthy ocean views dominate at this gated five-star resort edged by two miles of white sands in Playa Mujeres. 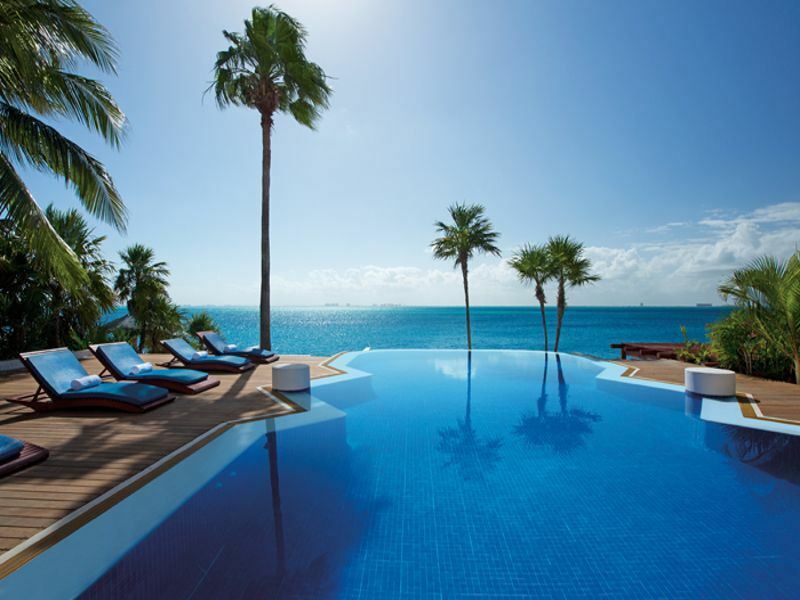 Just a short hop north from the designer shops and smart cocktail bars of Cancun, it draws style-focussed guests to its yachting marina, 10 pools, 13 hot tubs, and 18-hole Greg Norman golf course that’s ranked as one of the best in all of Mexico. The sleep: All of the 450 decadent rooms (including some that are just for grown-ups) assure state-of-the-art luxury. Expect king-size beds with pillow menus, oversized Jacuzzis, and spa-style bathrooms with rainfall showers, bathrobes, and slippers. Furnished balconies or terraces, flatscreen TVs, and complimentary fully-stocked minibars complete the lovely touches. The stay: Foodies can work their way around 12 restaurants before stopping for all-the-time happy hours in 16 bars and lounges. You’re also spoiled with a high-tech gym with cardio equipment and free weights, a head-spinning amount of fitness classes (pilates, circuit training yoga, meditation), and a fun-filled activity schedule for babies, toddlers, tweens, and teens. Equally fabulous is the ONE Spa that features a hydrotherapy pool, temperature contrast walk, Swedish saunas, ice room, tropical showers, and private rooms for well-deserved pampering. The scene: There’s a refreshing loungey vibe at this small-scale resort on Isla Mujeres - the four-mile-long island just across the bay from Cancun (the boat ride takes 20 minutes). Not only will you find two attractive pools, an outdoor seawater Jacuzzi, and a superb thalasso spa, but also there’s also very clued-up staff who offer nothing less than an attentive five-star service. The sleep: All of the 35 luxury-filled oceanfront suites come with king-size beds, sitting areas with sofas, and bathrooms with therapeutic showers, steam baths, and Bvlgari toiletries. Thoughtful extras include flatscreen TVs, minibars (replenished daily), nightly turndown service, unlimited worldwide calls, and private terraces that are perfect for admiring the sunset. The stay: Dining is a gourmet affair at two restaurants: Casa Rolandi for classic Swiss-Northern Italian cuisine and Le Métissage for contemporary French-Mexican fusion cooking. There’s also a lovely bar for anytime coffee and cocktails, a state-of-the-art gym for cardio workouts, and a slew of activities such as yoga, meditation, Spanish lessons, and wine tasting. You’ll also have the chance of upgrading to the Endless Privileges® programme which includes top-shelf spirits, fine wines, entertainment, and other elevated luxuries either on-site or at nearby resorts. 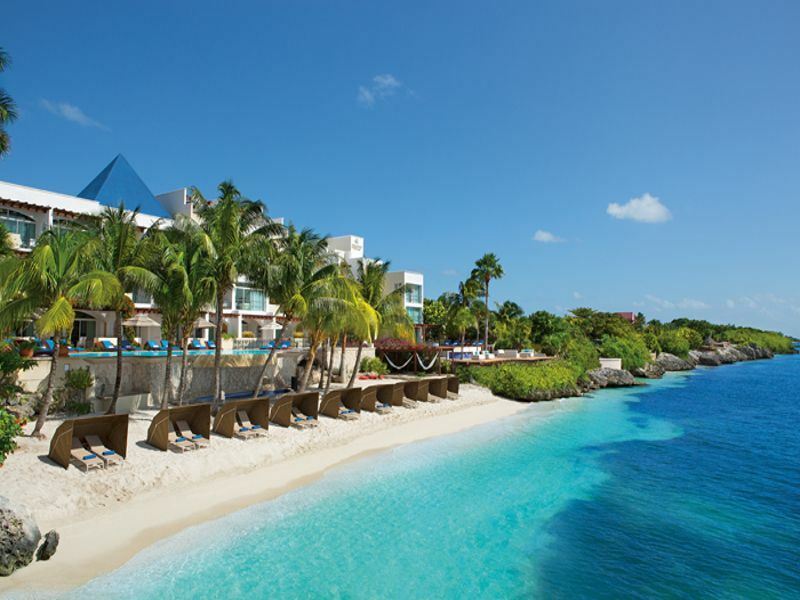 The scene: The sugar-white sands and crystalline Caribbean waters set the scene at this adults-only resort located between Cancun and the charming coastal town of Playa del Carmen. The vibe here is very casual, with life revolving around the outdoor diversions, the one-on-one pampering, and the six freeform pools that wind through the manicured grounds. The sleep: Expect a wealth of indulgences in the sumptuous rooms and suites, all of which have king-size beds (or two doubles), high-tech gadgetry (flatscreen TVs, iPod connectivity, free Wi-Fi), and marble bathrooms with jetted whirlpool bathtubs and separate showers. There’s also a pillow menu, nightly turndown service, and excellent in-room liquor and wine selection. The stay: You’ll have access to 10 globe-spanning restaurants, 11 bars, a brand new 1,900-square-foot fitness centre with state-of-the-art facilities, and a whopping amount of land and sea activities such as kayaking, snorkelling, scuba diving, dancing, cooking, and yoga. Most standout, though, is the swim-up Miilé Spa - a good-looking beachfront sanctuary kitted out with 10 indoor rooms (including four couple’s rooms) for beauty treatments that incorporate nutrient-rich botanical and marine essentials to leave you looking glowing and gorgeous. The scene: It’s all rock ‘n’ roll glamour at this exclusive hotel-with-a-hotel on the dazzling beachfront just a mile from the centre of Cancun. Perfect for those wanting a bit more of an adult-only vibe without any kids around, Heaven has all the luxuries you’d expect from the playful Hard Rock brand with the added benefit of its own separate beach, pools, and dining options. The sleep: All of the 577 contemporary rooms and suites are stylish living spaces complete with king-size or double beds, private balconies, flatscreen TVs, iPod docking stations, tea and coffee-making facilities, and minibars stocked with soda, bottled water, juices, and local beer. The bathrooms have hydro spa tubs, Rock Spa® bath amenities, and wall-to-wall extras. The stay: The largest in the Caribbean with 75 treatment rooms, the Rock Spa® features steam rooms, hydrotherapy current pools, and even personal spa butlers. There’s also a yoga hut, meditation pond, fitness classes and outdoor sports (including golf on the 18-hole Robert von Hagge course), and a lively nightclub for live DJ entertainment and a decent selection of top-shelf spirits and cocktails. The dining facilities are just as impressive; take your pick from a huge amount of bars and restaurants - or simply keep it low-key and order room service. 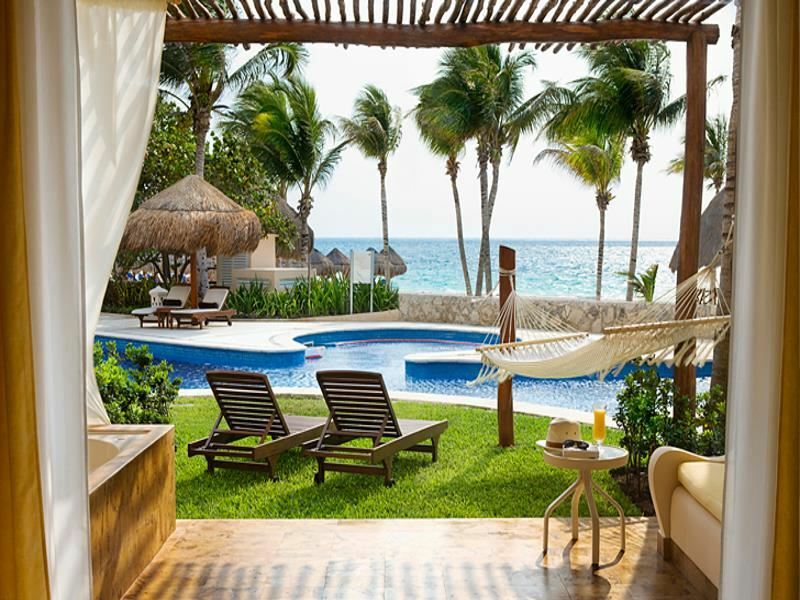 The scene: Upping the ante for a blissfully quiet stay, this ultra-luxe boutique resort near the seaside town of Puerto Morelos flaunts a drop-dead-gorgeous setting along a 500-yard private white-sand beach. Most appealing is the classic Mayan architecture, award-winning restaurant, on-site diving centre, and the very first certified thalassotherapy centre in North America. 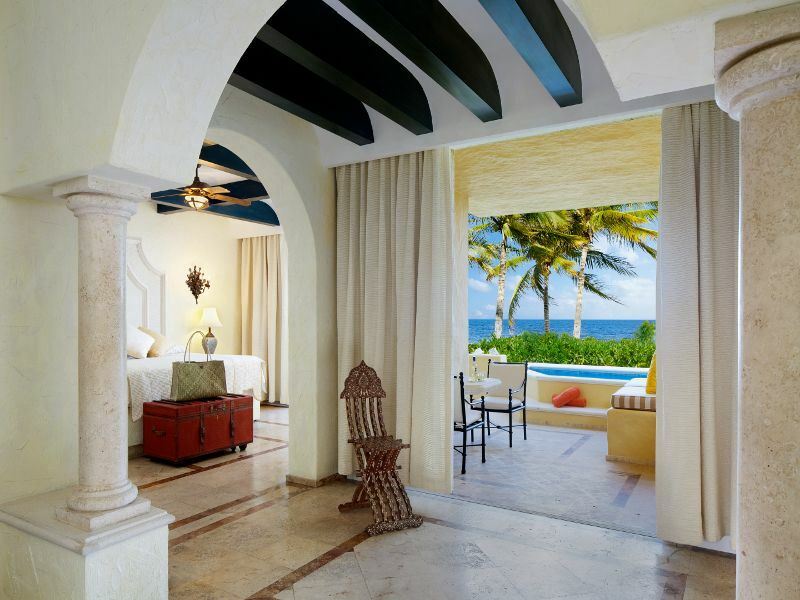 The sleep: The 90 one- or two-bedroom oceanfront suites all have private terraces for day-to-night lounging. There’s also king-size beds with aromatherapy pillows, espresso machines, minibars with drinks and deli snacks, flatscreen TVs, and CD/DVD players. The beautiful bathrooms have sunken bathtubs, glass showers, handcrafted sinks, and Bvlgari toiletries. The stay: Not only does this high-end hotel tempt with four superb gourmet restaurants, but it leaves no (hot) stone unturned when it comes to next-level holistic pampering (think everything from yoga, meditation and Tai-Chi classes, to acupuncture, Chinese medicine services, and Temazcal ceremonies with ancient Mayan healing practices). You’ll also have the chance of upgrading to the Endless Privileges® programme which includes top-shelf spirits, fine wines, entertainment, and other elevated luxuries either onsite or at nearby participating resorts. 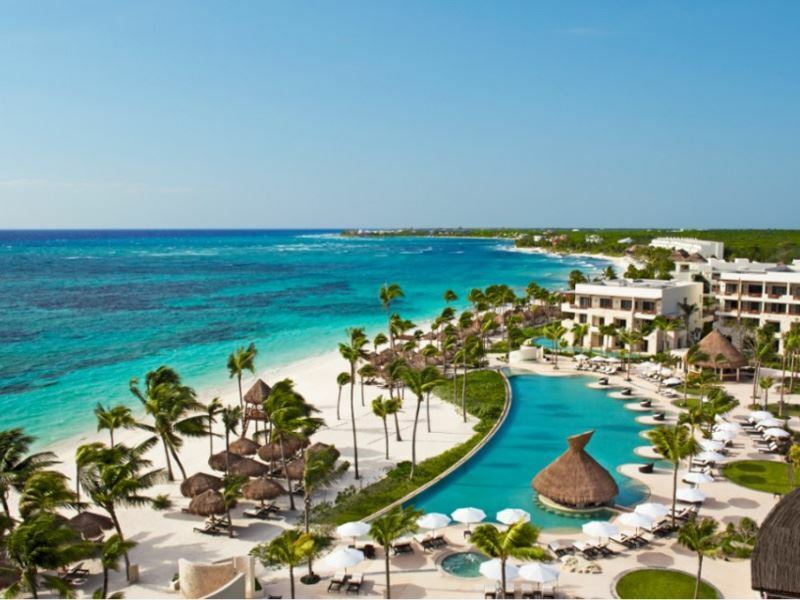 The scene: Perfect for those looking to slow the pace down a bit, this adults-only resort in the heart of the Riviera Maya overlooks the gleaming white-sand beaches and calm waters of Akumal - the coastal town most celebrated for its green sea turtle population. Everything you need is right on your doorstep, but if things too quiet, Cancun is only a 20-minute drive away. The sleep: All of the 434 generous-sized suites have a Jacuzzi-for-two, king-size bed (or twins), customised Mexican artworks, and striking views of the tropical landscape, pools, or sea. There’s also a private terrace or balcony, flatscreen TV, Nespresso coffee machine, DVD player, iPod docking station, and full bathroom with bathtub, slippers, and complimentary toiletries. The stay: There’s no shortage of Unlimited-Luxury® privileges when it comes to food and drink; expect six gourmet á la carte restaurants, a grill and buffet, six relaxed bars, and a delightful café that opens around-the-clock. Further thrills include enjoying top-to-toe pampering at the 18,000-square-foot Secrets Spa by Pevonia®, making the most of complimentary greens fees at Riviera Maya Golf Club, and dragging yourself away from your sunlounger to try exciting ocean-based activities such as snorkelling, scuba diving, deep sea fishing, and sailing. The scene: Just a short sashay from the coastal town of Playa del Carmen, this rustic-chic resort is set in lush jungle that lines a seven-mile stretch of picture-perfect white sand. 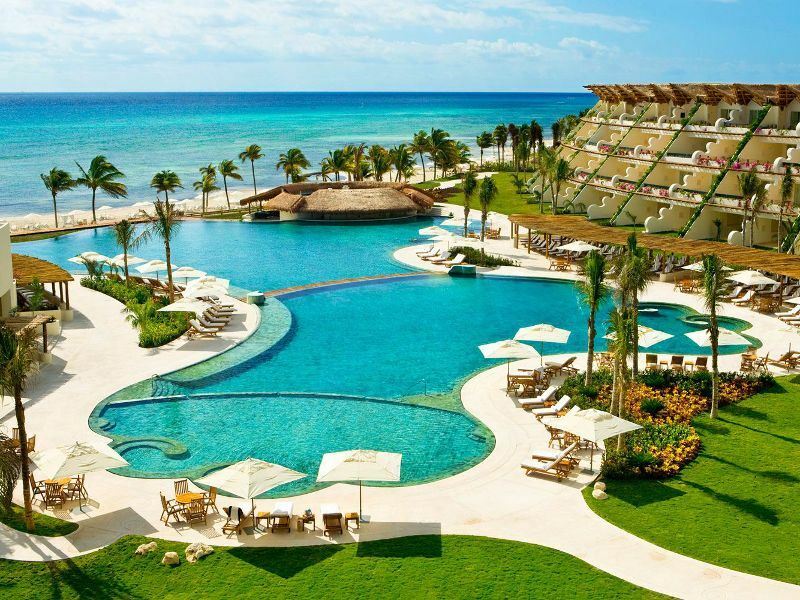 Ideal for those looking for a get-away-from-it-all hideaway, this place hits the spot with tasteful Mayan design, top-notch activities, and attentive staff who make you feel like a VIP from the get-go. The sleep: Assuring plenty of privacy, the 41 oversized villas staggered within the jungle-lined surrounds all have heated plunge pools and outdoor terraces with hammocks. There’s also four-poster beds, flatscreen TVs, and all the high-tech gadgetry you’ll need. Bathrooms have showers (both indoor and outdoor) and/or deep-soaking tubs, his-and-hers sinks, and high-end toiletries. The stay: If you’re feeling sociable, the resort’s sculptured lagoon pool is where you’ll find a team of eager-to-please butlers ready with ice-cold face towels and refreshing drinks. Further highlights include a full-service spa for treatments with marine elements and aromatic herbs, a small gym, an outdoor library for free-to-borrow books, and a slew of exciting watersports and excursions. Equally impressive are the two alfresco restaurants for prime meat cuts and seafood dishes (or simply arrange a candle-lit dinner right on the beach if you’re feeling romantic). The scene: The clue’s in the title in this high-impact resort named for its latitude and longitude coordinates (20º north and 87º west). Set on the stunning white beaches of Riviera Maya, midway between Playa del Carmen and Tulum, it’s modern Mexico at its poshest; not least for the sky-high level of service that includes a personal Anfitrión (host) available 24-hours a day. The sleep: Expect a mix of rustic and modern in the 448 elegant rooms, all of which have terraces with lounging areas and either semi-private swim-up pools or huge spa tubs. Further luxe touches include a king-size bed, minibar, free Wi-Fi access, bottled water, and Nespresso machines. Hypoallergenic rooms with air-purifiers for allergy sufferers are available on request. The stay: Food is taken very seriously here, and with five mouth-wateringly good restaurants headed up by revered global chefs it’s easy to see why. There’s also a stylish lounge for handcrafted cocktails and live entertainment, a holistic spa for spirit-soothing beauty rituals, and a choice of low-impact activities such as meditation and yoga (these are available at the beach and in the state-of-the-art gym). You’ll also get to enjoy a selection of watersports, poolside, and beachside services as well as exciting weekly pop-up events. The scene: Expectations are met at this seriously glamorous adults-only resort set on a ravishing alabaster beach at the northern end of Cancun’s Hotel Zone. Not only does it reach the top tier of the luxury ladder in terms of location, but it also provides style-hunters with designer-led décor, unparalleled facilities, and a new class of personal service. The sleep: There’s 260 marble-clad suites, all of which have a king-sized bed (or two doubles), double whirlpool tub, French balcony, oversized Apple TV with Wi-Fi and special apps such as iTunes and Netflix, and bathroom with Bvgalri amenities. The amazing choice of speciality pillows, bath salts, and aromatherapy scents for the perfect night’s sleep are a nice touch. The stay: The three shimmering pools (including one that leads down to a private cabana-lined beach), outdoor Jacuzzi, state-of-the-art fitness centre, and day-to-night activity schedule are all standout. Other highlights include teeing off on the Jack Nicklaus-designed course at the nearby Moon Spa & Golf Club, relaxing in one of 19 treatment suites at the all-marble BlancSpa, and savouring á la carte or tasting-menu offerings at 10 unique restaurants (including a sophisticated bar for live entertainment, made-to-order cocktails, and a deep wine list). The scene: Barefoot luxury finds its home at this high-end resort spread over 85 acres of white sand and lush Mayan jungle just five minutes from Playa Del Carmen. 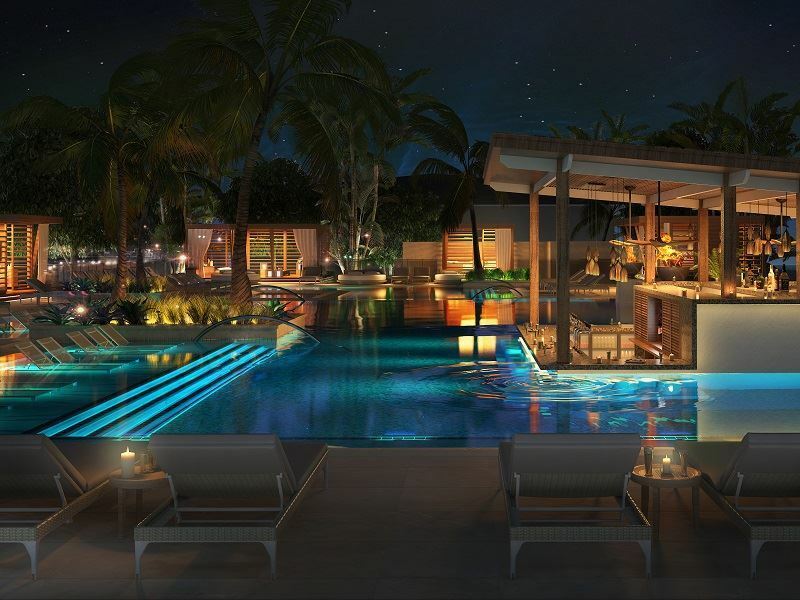 Perfect for those looking to play, relax, and enjoy the ultimate disconnect, everything is positioned so that you’ll never be more than a few steps from the glittering Caribbean Sea and the sparkling infinity pools. The sleep: All of the 539 stylish suites available in three zones (adults-only, family-friendly, Zen-like) have a private terrace of balcony overlooking the ocean or jungle (some also come with plunge pools). There’s also flatscreen TVs, CD/DVD players, tea and coffee-making facilities, and spa-like bathrooms with Jacuzzi tubs and rain showers (some also have massage tables). The stay: The monumental selection of chic gourmet restaurants, casual family bistros, outdoor eateries with ocean views, poolside bars, and hip lounges are likely to keep you rooted to the spot. 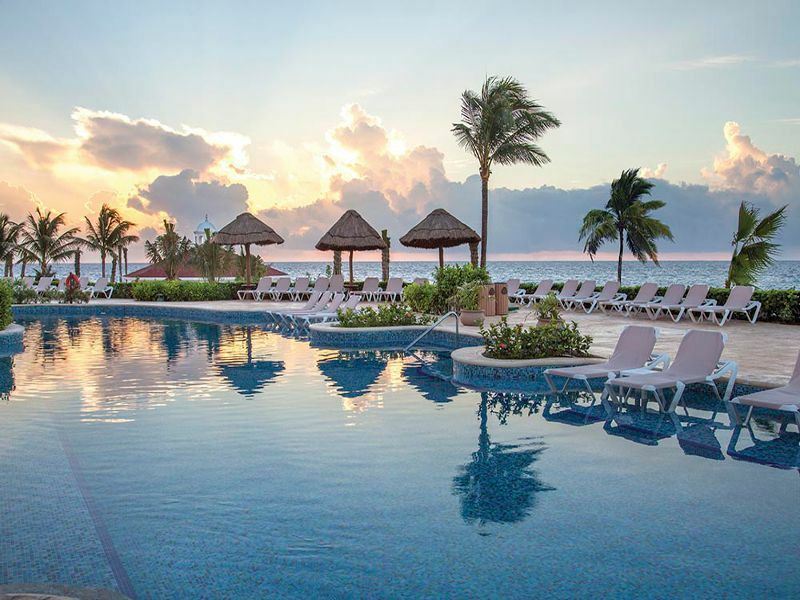 Also worthy of your attention is the SE Spa by Grand Velas for its romantic couples' rituals, seven-step water ceremony, and creative treatment and beauty menu. There’s also a kids’ club for fun-filled activities and an ultra-cool teen zone that has its very own club with a high-tech sound system and a nightclub that serves non-alcoholic drinks until midnight.